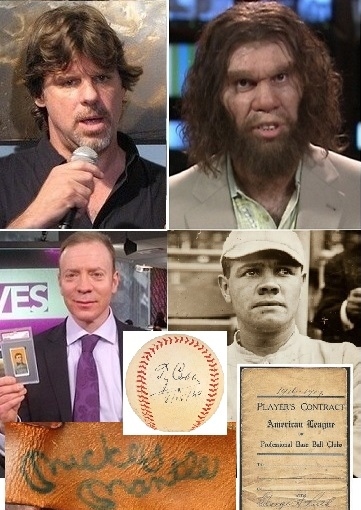 Michael O'Keeffe of the New York Daily News (top left) published another inaccurate report; Ken Goldin (bottom left) is offering several suspect items in his Babe Ruth anniversary auction. -The New York Daily News I-Team and Michael O’Keeffe devoted a full page of newspaper coverage to the court appearance yours truly made last week in Albany, New York. As a result of my having failed to file several NY State tax returns on time, I appeared and plead guilty to a misdemeanor for filing my 2012 state return late. My appearance was apparently big news and somehow appropriate for the sports section of the paper where Michael O’Keeffe rehashed previous reports about my legal wranglings with his personal associates– institutional thief Rob Lifson and convicted felon Robert Fraser. True to form, O’Keeffe reported information that was both false and misleading. -O’Keeffe knew that there was no sentence of probation issued but falsely reported that I had been sentenced to 3 years probation by the court. O’Keeffe wrote, “The Albany District Attorney’s Office says that Nash will be on probation for three years…” O’Keeffe, however, was well aware from the DA’s press release that 3 years probation was only the maximum penalty that could be issued by the court for such a misdemeanor and that no sentence of probation had been ordered. Having cooperated fully with the DA’s office during the process I had also paid my back taxes and fines before my court appearance, however, O’Keeffe also falsely reported that I was “ordered to pay $13,101 in back taxes and interest.” The DA’s press release clearly stated that I had already paid that amount without any order from the court. In addition, O’Keeffe continues to inaccurately claim in his reports that I am a memorabilia dealer and also failed to contact me or my attorney for an opportunity to comment on his story. Reporting the facts from a press release is so easy even a caveman can do it. Apparently it’s not that easy for the agenda-driven Michael O’Keeffe who clearly has an ax to grind with this writer who has been highly critical of his on-going journalistic malfeasance that appears to have contributed to his own legal problems including a lawsuit filed against him by A-Rod’s lawyer Joe Tacopina. The lawsuit claims that O’Keeffe is an “unethical newspaper reporter” and that his reports about Tacopina contained “numerous factually inaccurate statements.” In addition, the suit alleges O’Keeffe was involved in a conspiracy with convicted felon Bernard Kerik to file a complaint against Tacopina so he could publish an article describing the allegations. O’Keeffe’s conduct with Tacopina is reminiscent of his inappropriate and unethical relationship with Rob Lifson’s lawyers Barry Kozyra and Mark Eberle who are alleged to have committed ethics violations in order to enhance O’Keeffe’s reports targeting this writer. PSA/DNA says they could not authenticate the alleged Mantle signature (highlighted in red) on Denny Esken's alleged game-used glove appearing for sale at Goldin. 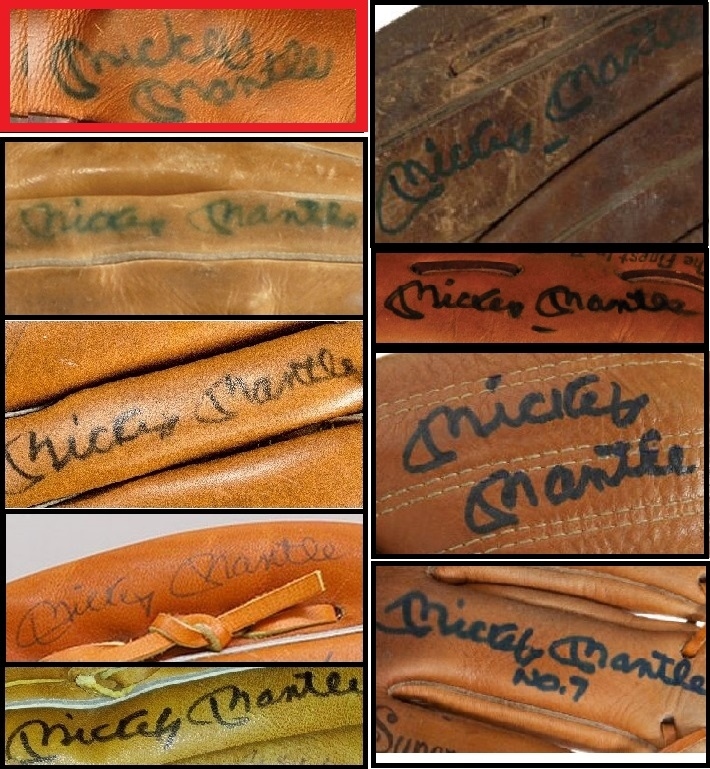 PSA/DNA did authenticate all of the other Mantle signatures appearing on other gloves (above). Several experts told HOS that the Mantle signature on Esken's glove is bogus. This 1916-17 contract between Babe Ruth and the Red Sox was sold by Lelands in 1994 and predates the current 1918 contract being offered by Goldin as the "earliest existing Ruth contract." Goldin says the Lelands contract is missing in action. 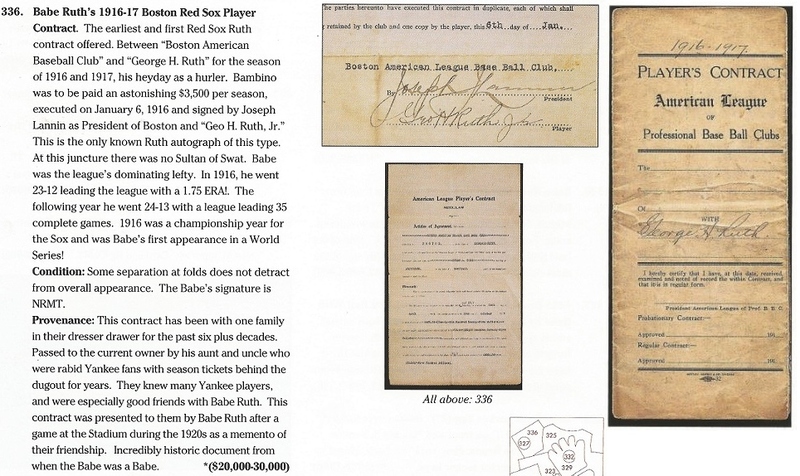 -Goldin Auctions also has a current bid of $670,000 on what they claim is the “Earliest Existing Babe Ruth Contract” dated from the 1918 season. That seemed odd to us since Lelands sold a 1916-17 Ruth Red Sox contract back in the 1990’s with an estimated value of “$20,000-$30,000. So, when we posted that information on Twitter Goldin Auctions responded stating, “Unfortunately, this contract has been missing for three years, according to its rightful owner. Presumed lost stolen or destroyed.” We asked the auction house if there was ever a police report filed by the owner but Goldin did not respond. Lelands Chairman Josh Evans also declined comment on the whereabouts of the contract and could not recall who won the lot back in 1994. Goldin appears to think that his claim to the “earliest contract” is valid because the whereabouts of the 1916 contract are allegedly unknown but he does not mention this fact anywhere in the lot description. The only way it could be the earliest contract would be if the 1916-17 document was, in fact, destroyed. Since Goldin can’t confirm that the contract does not exist, their claim to the earliest contract is misleading to say the least. Collectors, dealers and auctioneers should keep their eyes peeled for the Bambino’s player agreement from ‘16. The 1918 contract being sold by Goldin was once part of the Barry Halper collection and part of a cache of Ruth documents he acquired in the 1980’s. Halper said he purchased the contract from someone who found the documents in a shoe-box tucked away in the attic of Jacob Ruppert’s old house, but as chronicled in our upcoming book The Madoff of Memorabilia, Halper lied about the source of the most valuable shoe-box in baseball history. 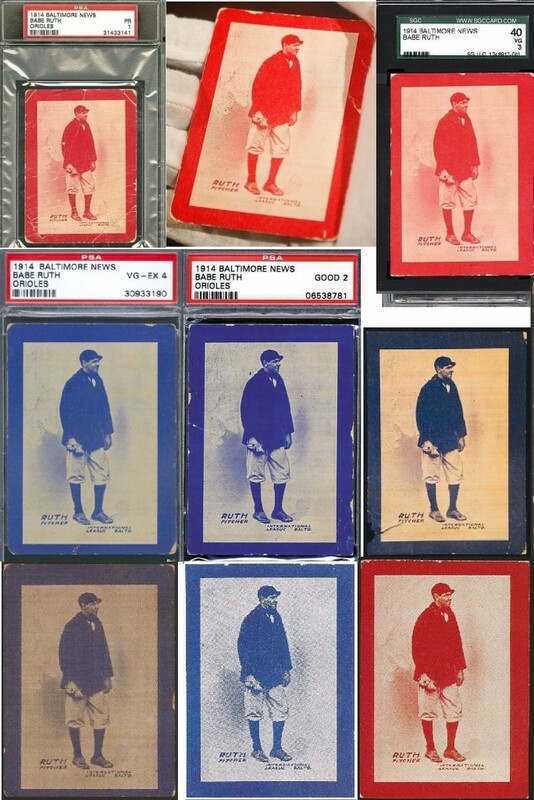 These are nine of the ten existing Babe Ruth 1914 Baltimore News rookie cards. -Babe Ruth’s 1916 contract isn’t the only Ruthian artifact known to vanish into thin air. In the past items including his 1927 World Series ring, his 1925 separation agreement with his first wife and even his last will and testament have disappeared. The will was recovered by the New York State Attorney General’s office but others are still at large. Ken Goldin is also offering one of the rarest and most desirable of Ruth artifacts known to exist—his 1914 Baltimore News rookie card. The current bid on the card is $390,000 but the lot has not yet reached its reserve. The card is one of only ten examples known to exist with five of those copies owned by collectors Richard Masson and Corey Shanus. Reports say that there was once an eleventh card in the possession of a collector but that example is said to have been lost or accidentally destroyed. If Ruth’s 1916 contract was also destroyed, that’s well over a million bucks in Bambino artifacts that have bit the dust. 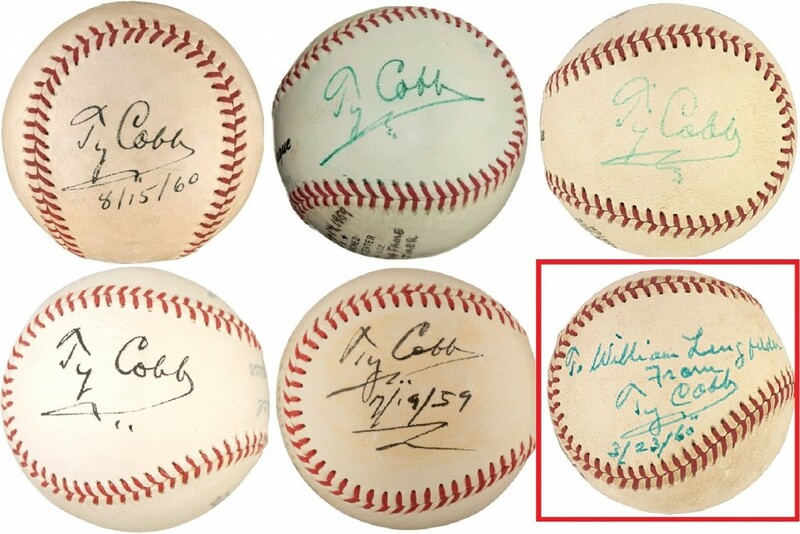 Experts say the Cobb signed ball in Goldin's current auction (top right) is a forgery. The ball is pictured above with other PSA and JSA-certed Cobb balls that experts also say are fakes. The ball highlighted in red (bottom right) is said to be authentic. -Operation Bambino has shed some more light on Babe Ruth forgeries and the styles of particular Ruth forgers but Ty Cobb runs a close second in the hobby fraud department. Goldin is currently offering a Cobb single-signed ball that has been identified by numerous experts as a forgery of the “Georgia Peach.” The same ball sold last year at Legendary Auctions and was identified after the sale as a forgery in a Hauls of Shame report. Both PSA/DNA and JSA have a long history of authenticating Cobb fakes and you only have to view the Goldin example with other PSA and JSA-certed balls that experts say are fakes to see that the so-called gurus at PSA and JSA know as little about Cobb as they do Ruth. Kick him in the grill, Pete! I remember when I was in “Caddy Shack” with Michael O’Keefe. Danny Noonan: I planned to go to law school after I graduated, but it looks like my folks won’t have enough money to put me through college. Judge Smails: Well, the world needs ditch diggers, too. Michael O’Keefe should win a Pulitzer for his accurate and awesome reporting. What else would you expect from the Daily News. Nice editorial oversight. The Goldin website says that the 1918 Ruth contract has a current bid of $720,000 before the live auction bidding starts tonight. The Mantle glove featuring a signature experts say is a forgery sold for $181,000 at Goldin Auctions and the 1918 Ruth contract sold for $1.02 million while the Ruth Balt-News rookie card failed to reach the reserve and went unsold. The person who bought the Mantle glove believing it to be a good signature must really have “stupid” money to throw away. Angles on almost all letters are very off.